Rev Peter Gardner, the Pioneer Minister for the Visual Arts in Glasgow and his wife Heidi, who work together as Gardner & Gardner created the installation specially for the season of Advent. Peter says the couple were inspired to create the piece by the angel’s words to the Shepherds in the nativity story— ‘Do not be afraid’ (Luke 2:10). The phrase is used many times in the Bible— for example, when the angel tells Mary she will have a child. “Heidi and I were in Berlin when, on 19 December 2016, a lorry was driven into crowds at the Breitscheitplatz Christmas Market, killing 12 people and injuring dozens more. “We shared in the sense of horror, shock and disbelief which the citizens of Berlin felt after the awful attack. “The next day, the daily newspaper, the Berliner Morgenpost, responded with an amazing front page; an image of the Brandenburg Gate with the German flag projected onto it and below the image the only words on the page were ‘Fürchtet euch nicht!’ Lukasevangelium Kapitel 2, Vers 10, ‘Do not be afraid’, Luke’s Gospel, chapter 2 verse 10’. Rev Peter Gardner and his wife Heidi have been working on the installation which was first conceptualised two years ago. “Waking up that morning to these words of Scripture was incredibly comforting and the seed of an idea was planted. “This idea gradually developed over time into a concept for an Advent installation and for the past two years we have been looking for a suitable venue. “A couple of months ago we approached the Kirk Session of Langside Parish Church with a proposal to site the piece in the foyer of their building and were delighted when they agreed. 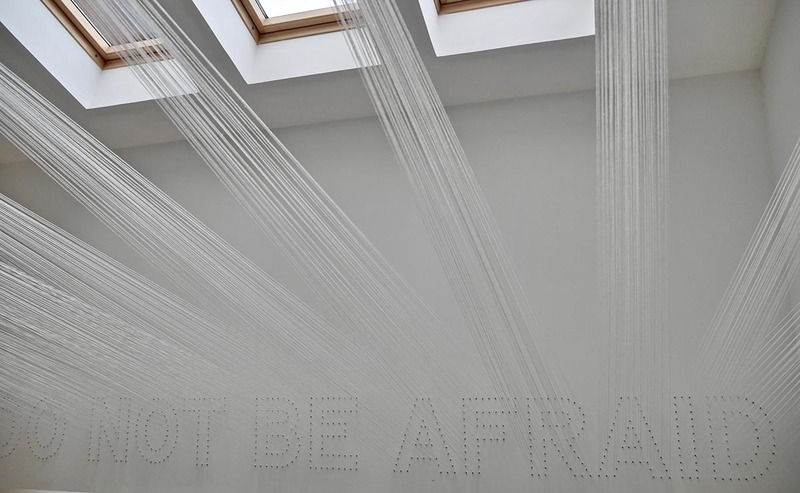 “The temporary installation consists of 656 nails hammered into plasterboard, forming the quote ‘Do not be afraid’. 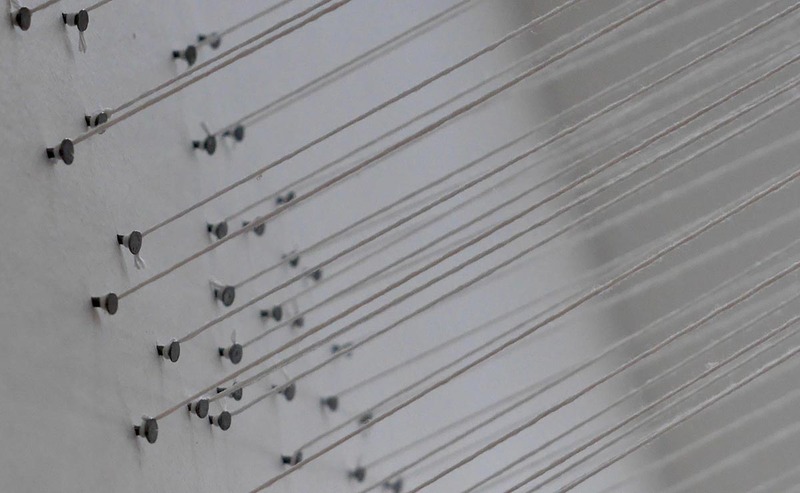 “On to these nails are tied lengths of white yarn, which stretch 3 metres across to a metal balustrade. “It fills the space above head height in the foyer, utilising the balcony, walls and natural light, drawing attention to the phrase which appears four times in the story of Christ’s birth. “Repeating these words in the context of contemporary uncertainties gives them a new relevancy. A close-up of the art installation which has been made with nails and string. The minister at Langside Parish Church, Rev David McLachlan, has been supportive of the installation and believes the message will comfort those coming through his church building during the busy month of December. “The installation is deceptively simple yet striking in its impact,” he said. 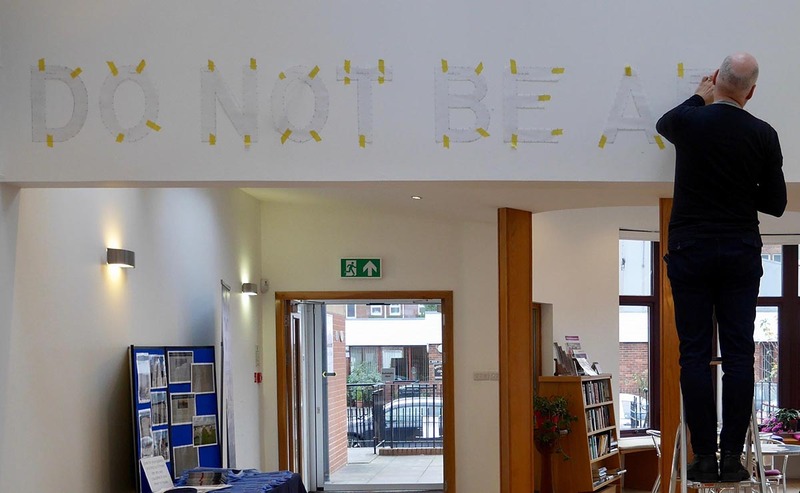 “Our church building is much used throughout the week and many people have commented on the message – ‘Do not be afraid’. We hear these words a lot - at this time of year especially. “It is actually the most common command in the Bible. We live in a world that is scary and there are plenty of things to be afraid of. God's message to us is not based in pretending that these things are not real but about encouraging us to know that there is another reality. “Thanks to Jesus' birth, light has come into the world and the darkness can't defeat it. And we are called to proclaim that hope as well as standing against the darkness. “God loves us and God is with us at all times. “Our task is to allow our lives to be grasped by that truth and to share God's love with those around us.